This is it! My final piece for my series of 2017!!! I couldn't have finished on a better subject than the beautiful David Bowie. My favourite part of creating pieces always starts with searching for the perfect reference - when it comes to my process, all my pieces start with the reference and the entire design/outcome goes from there. There was no exception when creating Bowie. With so many amazing shots from studio photography to glam shoots, I was inspired to show the different sides of him from the critical thinker, philosopher to the creator and performer and rebel we all knew him to be. As you will see further down when I look back on the series - By the time this piece came around, I was able to fully let go and trust the process of creating, without the need to control and push the direction. This piece for me represents iconography and symbolism, with small details to tie the piece together - I couldn't be happier to finish the year with this piece. 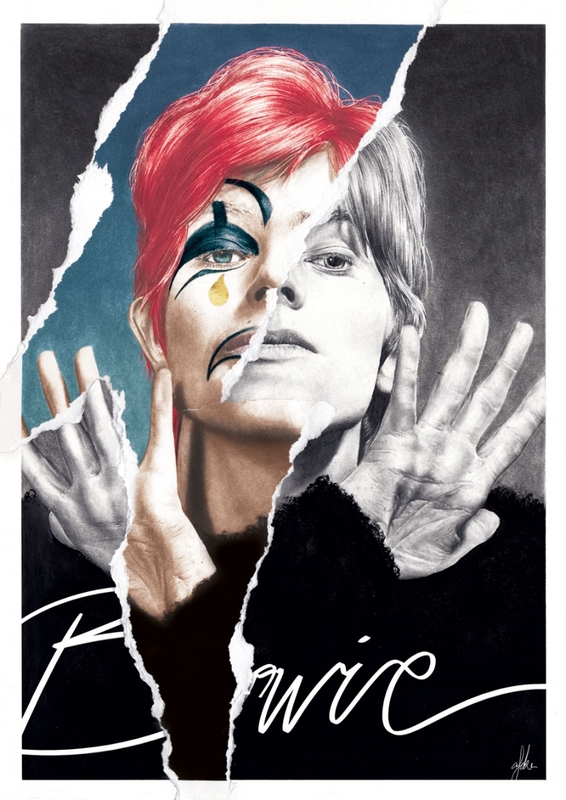 With my final piece revealed - The legendary/iconic/creator himself, David Bowie, I wanted to take this chance to look back on the series in all it’s glory. This star sign series was easily one of the best projects I’ve ever created for myself. With each piece came experimenting, challenges and watching my work evolve. Although I didn’t fall involve with every finished piece, every one of them held an important part of the year-long journey. Given the subject/s of each month was someone who I resonated deeply with - this year was more focused on creating for myself, rather than for my audience. It became an important part of the year as it was always a reminder to create from within, rather than around - and piece by piece I saw my work change and represent more of ME in my work. From being self-indulgent to trusting the process, like anything, the start of the series came with throwing ALL my ideas into one piece, as the months went on I started refining my style and ideas. By the end of the series, I was able to completely let go and trust the process fully which is something entirely new to me. I think the best thing I got out of this series, which shaped my work/style and process was planning and creating ahead. On the surface organised Alex LOVES this idea, however, I found myself creating with a lot more ease in the last half of the series and being able to let go of the control. The closer I got to deadlines the more difficult it was to hold control and the best results came from trusting the process fully. Although a year long timeline for a series sounds like a huge commitment, I found it SO much easier to maintain and make the most out of it in comparison to a 30 or 14 day challenge that required focus every single day. A year long series throws you challenges but also allows you time to breathe and find your way - it was always in the front of my mind but gave me enough space to create outside of the series during the year and without a doubt changed my work and working style. With some early planning and trust in the end result I would highly recommend taking a project like this on board.